With experience in Anthem, Scottsdale and the North Valley real estate as well as intimate local area knowledge we work extensively to help buyers and sellers meet their real estate goals. If you are looking to buy or sell a home or would just like to know some more information, feel free to call or Email us. 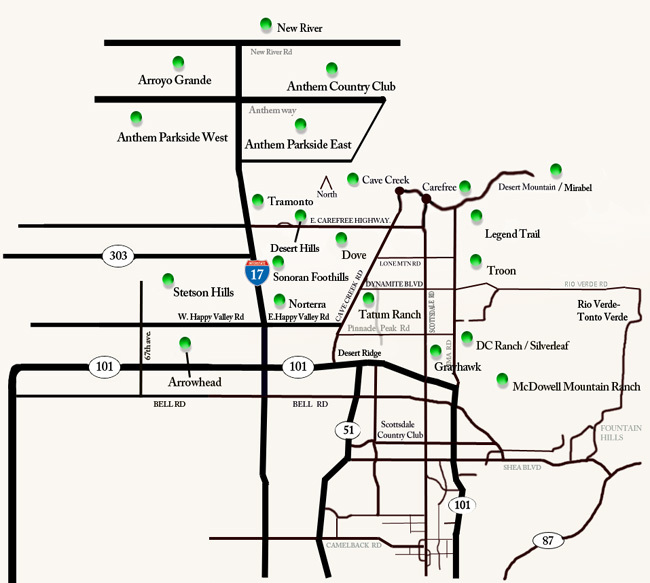 As agents in the Greater Phoenix Metro area our extensive marketing plan gives a homeowner the opportunity to get the maximum value for his/her property. For buyers, we help negotiate the best possible deal and search until we find the perfect property. Nothing satisfies us more than seeing the smiles that come with a successful sale or the purchase of a lifetime. Thanks again for choosing Bryan Lee as your on-line Anthem, Scottsdale and North Valley real estate source. Click on “Green” button to find a listing in your area. USA Today reported on nine retailers with the worst customer service in the United States. Some companies that made the list include Walmart, Sears and Netflix. You can read the full article here. So what can you do to prevent yourself from making a similar “worst customer service” list in your city? With all the paperwork and day-to-day logistics involved in managing your real estate business, customer service may not always be at the forefront. However, in the business of buying and selling homes, it’s all about the people. Here are a few ideas to amp up your people skills and help you to shine against the competition. Position yourself as an expert in your community. If your client is moving to a new area, give them some insight on the best places to shop, dine, workout and have fun. This will not only help your rapport with them, but it will keep you in mind the next time they’re looking to purchase as well. The process of buying or selling a home can be a deeply personal experience. Your clients may vary from newlyweds looking to find a starter home to begin their life together or to someone who is moving because of a passing or divorce. This means the search for a new home or selling of an old one can mean so much more than just MLS searches and signed papers. Be mindful of this, celebrate with the young family or be considerate and gentle with the client who is saddened by the move. End the sale with a memento. Maybe it’s a nice plant for their home or even just a simple card thanking them for their business. In a world full of electronic everything- emails, text messages, snapchats, instagrams, you name it, it’s nice to show you care and give something that you don’t have to receive in your inbox. At the end of the day, real estate is all about relationship building so be sure to make customer service a priority in your business. And let us know if you have a great customer service tip that keeps your clients wanting more.